Last week I had the exciting opportunity to chat on the phone with Gwen Cooper, author of Homer's Odyssey, Homer: The Ninth Life of a Blind Wonder Cat, Love Saves the Day, and the Curl Up with a Cat Tale series. 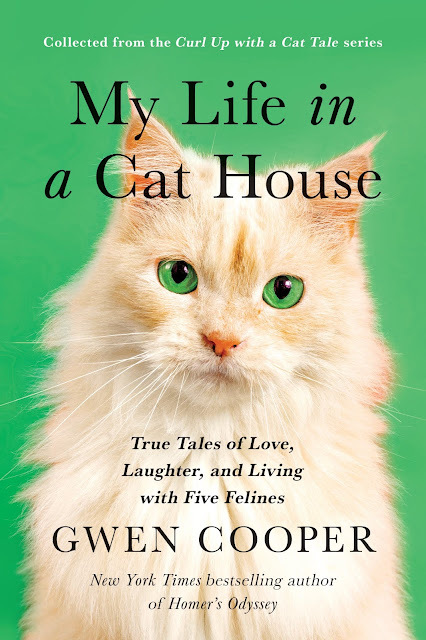 Gwen asked us to share some exciting news about her brand new release, My Life in a Cat House. Here's what you need to know, straight from Gwen! MY LIFE IN A CAT HOUSE comes out on October 30th, and I'm donating 100% of my royalties on all pre-orders and first-week sales (through November 4th) to Blind Cat Rescue and Sanctuary in Raleigh, NC. Also, if you pre-order a copy of the book from your local bookstore (including chain bookstores, like B&N), you can enter to win a visit from me! Just email me at gwen@gwencooper.com with your name, your city/state, the name of the bookstore you pre-ordered the book from, and the number of copies you pre-ordered. Each pre-ordered copy counts as an entry, so if you buy two you double your chance of winning! And, of course, the more people who pre-order in the same town, the likelier that the winner will be in that town--so call your local bookstore TODAY, and get your friends to pre-order, too! Online pre-orders from Amazon, etc. will not count for contest entry unless you pre-ordered online September 16th or earlier. I will, however, make the same 100% donation to Blind Cat Rescue regardless of where the book was ordered/sold. Please take note -- for your donation and contest entry to count -- if you pre-order the book from your local bookstore, you then must actually go to the store and purchase your pre-ordered copy or copies between October 30th and November 4th. If you pre-order but don't buy and the bookstore has to ship their copy back, I will get charged for that out of my royalties, and it will take money away from the Blind Cat Rescue donation. Seeing Gwen Cooper talk at BlogPaws (2016) was hands down the best session of the three years I've gone. I learned so much and it was exactly what I needed at the time! we just adore Gwen and were thrilled to talk to her too! This is bound to be a fantastic read, and it is most certainly for a wonderful cause! Gwen we are really excited about this book and the help that it's going to give to so many. We thank you very much and we will be pre ordering our copy. Can't wait to read it. Thanks for the wonderful post. Have a great day everyone. This looks great! And how kind of her to donate to such a good cause.